Wow. What a couple of weeks. we have encountered all sorts of extremes in regard to terrain, weather, sleeping conditions, and more. First of all, we would like to extend heartfelt thanks to Matt and Mary Cohn of Helena, MT, for their hospitality during our stay in Helena. 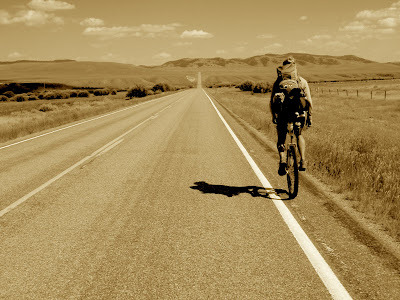 At a post office, Matt C. stopped us to ask if we were "the unicyclists" riding the Great Divide. As it turns out, he had heard of us when he rode the Canada section of the route just after we had passed through. Later, we had (a freshest of fresh) dinner with them and their friends who also had seen us earlier in our journey, in Big Fork, MT. As the world continues to shrink, our perspectives expand as we encounter extreme experiences. We have finished riding through Montana: a milestone that gave us the confidence in our ability to complete the entire journey, as the state boasts some of the most difficult terrain of the trip (so we've heard...). [Lava Mountain Trail between Helena and Butte, MT. Our stay in Butte was a pleasant one, and we are grateful to The Outdoorsman bike shop for their services, friendliness, and donation of a well needed water bottle. The Outdoorsman is owned by the Leipheimer family. For those of you who follow the Tour De France, Levi Leipheimer is a famous bicyclist who competes in those big-time bike races. His brother, Rob, helped us during our stay in Butte, and my world shrank once more as I discovered that he used to work at the same bike & ski shop in Davis, CA that I have worked at: Ken's Bike & Ski. The cows are everywhere. Even as we slept, they tricked us into thinking they were bears seeking our food. A 70-mile day brought me to Lima, MT. That's right, a whopping 70 miles, followed by only 5 hours of sleep, warranting a rest day. 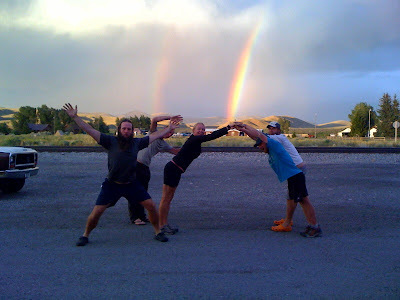 The Mountain View Motel is a haven for long-distance cyclists and hikers; another cyclist and several Continental Divide Trail thru-hikers made the stay jovial and entertaining. Here's a shout out to our new friends: Neil (Bubbles), Numbskull, Dirty Bird, Panda and Valley Girl! And, a cook-your-own-steak joint in town ain't so bad either. A vicious storm rolling through inspired us to take teh entire day off, leaving us with incredible company and a double rainbow to boot. ["7" - and into Idaho! [What would a state line be without climbing the sign? The last bit of riding in Montana, and most of the non-paved portions of Idaho and Wyoming thus far, have been jarring. Let's just say that there have been multiple days of wearing double-layer chamois shorts, wishing for smooth terrain. Unpredictably, some of the more maintained roads are the worst, due to the grading process; smoothing the road for cars often means making the gravel impossible to avoid. Then add washboard. It makes me wince just thinking about it. Thankfully, we had a fun crowd to hang out with in Sawtelle, Idaho (near Island Park and Mack's Inn): Slow Joe, Randy, Delmont, et al. Yeti, thanks for letting us sleep on the floor of your hotel room; and Daniel, keep on truckin' - can't wait to see you down the road! A notorious section of trail is along a rail-trail through Idaho. Rail trails are old railroad beds that have been turned into recreation trails; this particular one is used by everything from hikers to ATVers. The latter tear up the trails quite badly. This particular day was simply not my day. For me, it was the worst day of the trip thus far. I woke up very sleep-deprived. I fell down early in the morning and busted my knee, complete with blood dripping down my leg. A mosquito bit me in the only spot I had not applied bug repellent - on the top of my foot - when I took off my shoe to empty it of invasive volcanic soil. I lost my only other pair of socks. My seat pain heightened. I spent several moments curled up on the ground bawling due to severe pain in my abdomen. At the end of it all, I could not eat the dinner I had so eagerly anticipated because it was way too spicy. And so I was reminded of the differences between adventures and vacations. But the day was not all bad: we were offered a ride into an off-route town shortly after the storm reached its worst (thanks, Paul! ), the rail trail ended in amazing scenery, and we were not bothered by the black bear Matt saw dash across the road in front of us. Riding up out of the Warm River canyon, a storm hit hard. It was raining buckets, and as we reached an open expanse at the top of the climb, lightning and thunder were simultaneous directly ahead of us. the lightning was hitting repeatedly only a few hundred yards away, but directly in our path. I didn't want to do CPR, nor have it done to me, so we turned around to find shelter, and hitchhiked off-route to nearby Ashton, ID. [Reusing our labels & box, and reapplying our packing tape that we most clearly bought up in Canada. Nearing Yellowstone and Grand Teton National Parks meant two things: frequent photography and witty comments. A sincere "thanks" goes out to those passers-by who treated us like people, and not like bull moose. But, to the guy who drove past saying, "You're missing a wheel!" we have one thing to say: you're driving a mini-van. The only way to cope with the copious amounts of people taking pictures of us was to take pictures of them taking pictures. If it didn't stop their photographical antics, it sure made them chuckle in embarrassment. I will spare you all the 15 or so pictures I managed to capture of tourists with cameras pointed at yours truly. In contrast, there were some awesome people we met who actually took the time to treat us like people, instead of moose. Meeting The Watts family was a highlight of the day; they were really encouraging and supportive of the cause. They also play the bagpipes, which makes them that much cooler. As we finish up a day of recuperation in Jackson, Wyoming, at the welcoming abode of Bill, Story, Avery, and Felicia Resor (went to Duke with Avery), we feel so spoiled and cared for by their hospitality. There's something to be said for food that can't be found at convenience stores (a rarity for us). Spare time lately has been stuffed full of tasks, including sewing projects, attaching pieces of flare, finding ways to carry less gear, washing clothes in streams, and eating very frequently: The Appetite has arrived. While we ride, we often think get creative with how we will next fill our water bottles or find a place to sleep. During the nights, I have battled overheating and overcooling, each leading to restlessness and sleep deprivation. And such is the nature of adventures: journeys with unknown stepping stones and outcomes. p.s. Sorry if the satellite tracker link on the main website has not been working; we don't know what is wrong with the transmittance, and are sending out messages that should post at least once daily. We hope the problem fixes itself - it's a SPOT thing, and out of our control.... thanks for your patience! We got your postcard today and passed it around the office - we are so proud of you! We continue to follow your progress and I give updates at our staff meetings. 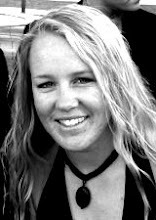 If you still have questions about fundraising, give me a call during your next rest day! Why do you cry so often Gracie? You guys are awesome! Thanks for sharing all the words and photos. 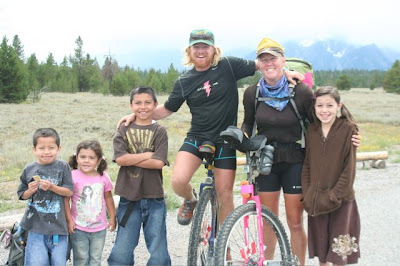 I just finished an obsessive following of the Tour Divide, trying to imagine doing it on a uni. I still can't imagine it, but now I don't have to because you two are doing it...and bringing it to life. Keep it up, chiquita (and Matt)! I'm in the wrestling office wishing I was back out on the road... you guys are amazing. The pictures are spectacular and the videos are awesome (and difficult... to create... esp the ones where you're riding...). Keep rolling along - I'm proud of you guys! Happy birthday, Gracie!!! We hope saddle sores subside on your special day, and that your ride is smooth and special. Loved all the recent pictures. The U.S. has some amazing sites. Congrats on all your travelling, both of you! FYI, the SPOT signal looks like it's working OK on my end, so I'm assuming it works for everyone else. Baby, as usual, great and graphic pictures and lively narrative. Well done. But for the people and beautiful scenery, I think most people would find such a trip excruciating. Hopefully, the blog readers and those who hear about the trip will be motivated to contribute to the cause. Full steam ahead. We love you.